MacMillan's Fourteen Little Pictures is going to be the main, if not the only, reason for purchasing this disc. They are consummately crafted miniatures, each with its own distinctive atmosphere and instrumental texture. Part of the pleasure here is in watching how the transitionary passages that bind the fragments together shift seamlessly from one view to the next. The impression left by a casual hearing might be one of modernist spikiness, but that does not get to the heart of what MacMillan is doing. In a truly modernist work the violent gestures and textures would be meant to disturb and disrupt our normal modes of thinking. Here they are used as an alibi for the introduction of some ear-friendly neo-romanticism: accessible melodic phrases, simple recognizable rhythmic patterns and even some rippling arpeggios. Each forceful outburst is balanced by a comforting emotional response. It might be expressive (no. 8), touching (no. 12) or nostalgic (no. 14), but never quite stoops into vulgar sentimentality. What we have, then, is the music of consolation: MacMillan is leading us by the hand through the frightening landscape of the modern world and assuring us that ‘everything will be alright'. 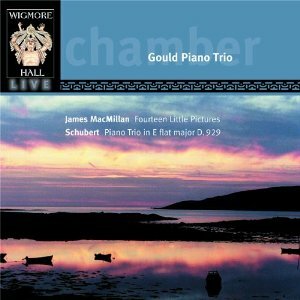 There could not be a greater difference in compositional outlook between the concentration of MacMillan's minute-long sketches and the vast expansiveness of Schubert's second piano trio. The abundance of song-like melody and tendency to luxuriate in instrumental textures throw up special problems for the performers. In the chamber music of Beethoven or Brahms, every bar has the important structural function of articulating the whole. A little analysis can give the performer a reasonable idea of what he or she ought to be doing at any point in the music. The same cannot be said of Schubert. Indeed, when his friends complained that the development of the finale was too long he was able to cut two sections without damaging the movement's integrity. The Gould Trio have clearly expended a lot of thought in deciding how to deal with the lack of forward momentum. The first movement provides the best example of this. The exposition divides into four distinct melodies – the first two making up the first subject and the second two the second subject. The group have chosen a different tempo for each of the four themes to provide interest through contrast. An unexpectedly plodding pace is taken for the opening theme, diluting its scherzo-like character. The reason for doing this becomes apparent when they speed up for the second episode in the unexpected key of B minor. The more lyrical character of the final two themes is emphasized with a distinctly slower tempo and a lighter touch, especially in the fourth which acts as a codetta. The development section, which is – unusually for Schubert – based on the codetta, comprises three giant waves built out of a relaxed modulatory dialogue between all three instruments. In the four minutes or so that it takes Schubert to work through this scheme, which doesn't build to a Beethovenian motivic climax, the players show supreme control by creating a massive arch shape over the whole. By doing this, they make sense of the melodic climax when it does occur much later in the coda. The beautiful Swedish folk song given to high cello in the second movement is never really allowed to sing. The march-like staccato accompaniment in the piano starts off a little bit too con moto and not enough andante. In fact the 2/4 becomes a two in the bar rather than the four it should be. The cellist, who clearly wants to play more expressively, sounds hurried. We do finally get some expressive playing when the second theme arrives, but then that ought to assume a bouncing lilt as a foil to the seriousness of the first. Neither the agitated irruption in the middle of the movement or the poignant return of the folk song with altered chromatic accompaniment towards the end manage to stir the emotions. For the most part, the balance between strings and piano is well judged. When the piano has the melody it sings out over the strings. This is the exception in recordings of piano trios where the engineers tend to over-compensate for the relative power of the piano. However, in the scherzando the piano plays una corda, making it subordinate where it should be equal, and turning the two-part canon into a melody with contrapuntal accompaniment. After enervating the opening scherzo-like theme of the first movement, the trio needed to introduce some Haydnesque wit here, but sadly none was forthcoming. The finale confirms the impression left by the earlier movements that Benjamin Frith's playing is often a little mannered. The folk melody might be composed of small building blocks, but it is actually long breathed. His habit of playing the last note of every little sub-phrase much more quietly than the others tends to chop the phrase up making it sound unnatural. Also, the second theme is marked L'istesso tempo (the same tempo), and perhaps they observe this, but it lacks vigour. Even the virtuosically executed semiquaver runs never really catch alight. The playing here is technically flawless, the instruments are for the most part nicely balanced against one another and the tiering of dynamics and tempi is well thought-out. Unfortunately, it lacks drive and the result is anaemic.